No More Areas With Weak Coverage! The Wide Package is tailor made for those suffering from weak signal coverage areas. 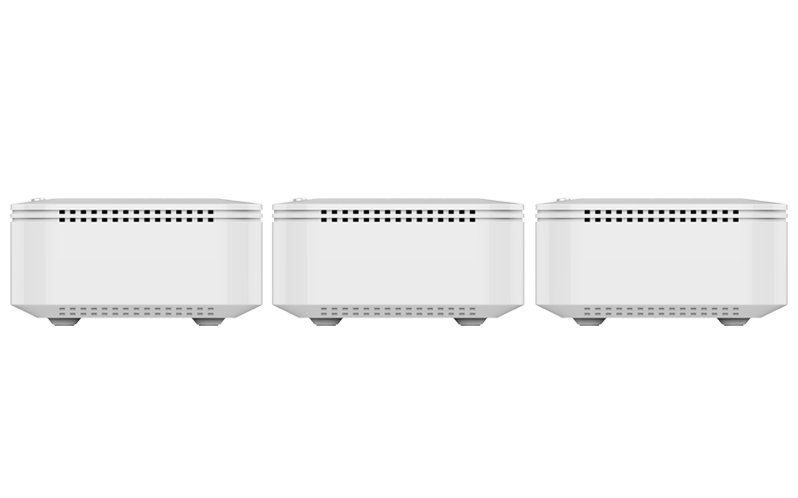 The package features three E3 devices, each guaranteeing speeds of up to 1200Mbps to easily blanket larger homes with strong Wi-Fi signals. 1. 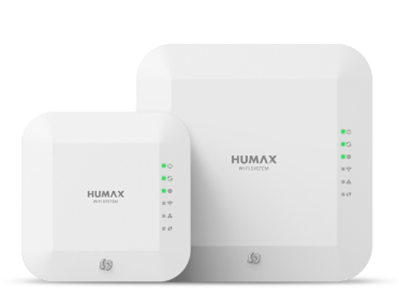 What Is HUMAX Wi-Fi System? 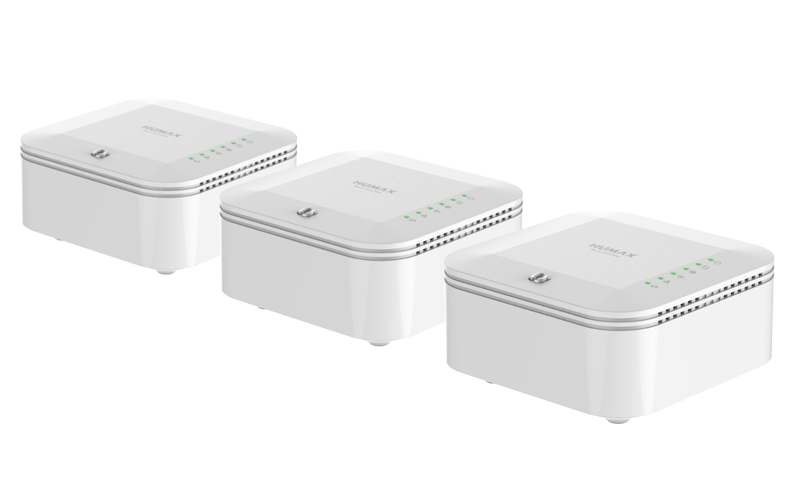 a package product that is preconfigured to connect (hereafter referred to as ‘paired’ or ‘pairing’) between two or more routers, and widens the range of Wi-Fi wireless environment at your home without difficult installation or setting. 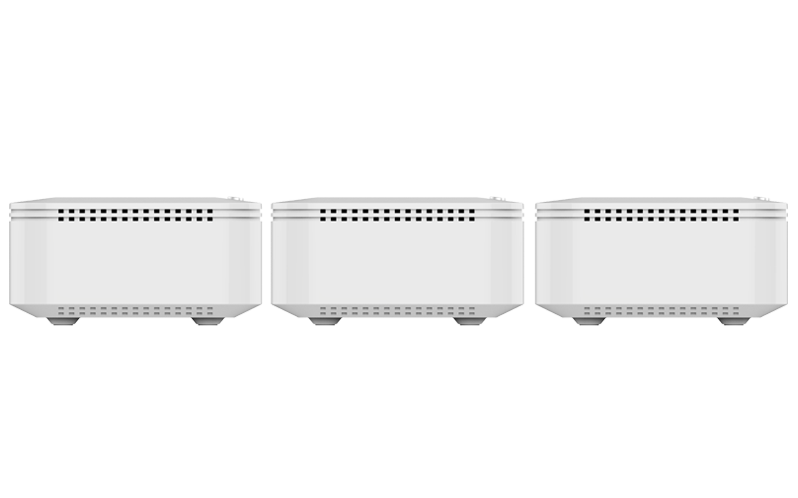 This system allows individual routers to be installed in the best spots, so that Wi-Fi can be used throughout your home. Here, the Wi-Fi operates as a single network. With only one network name (SSID) and password allocated to every actual user, you can experience Wi-Fi roaming more seamlessly without any need for several Wi-Fi settings. What is ‘Master’ and ‘Node’? Master refers to the main router connected to external Internet network or modem. Node refers to such a router working in conceptual form of ‘extender’ as connected with the master. one master consists of one or two nodes. 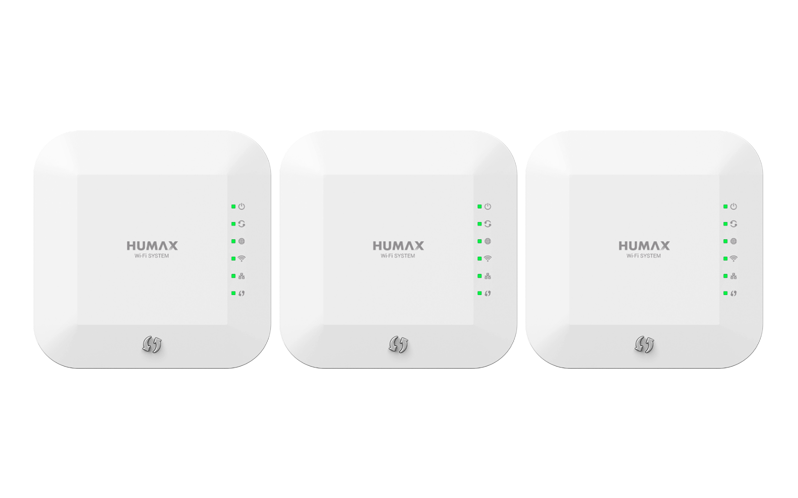 HUMAX Wi-Fi system allows you to set up to 3 nodes per master. You can just select a desired package depending on the number of nodes based on the structure and size of your home where you want to install the system. For more detailed information on our product packages, please refer to ‘Product Information for Each Package’ in FAQs. Now you can see and get various packages of HUMAX Wi-Fi systems that can improve inconveniences of existing router or Wi-Fi system in use! 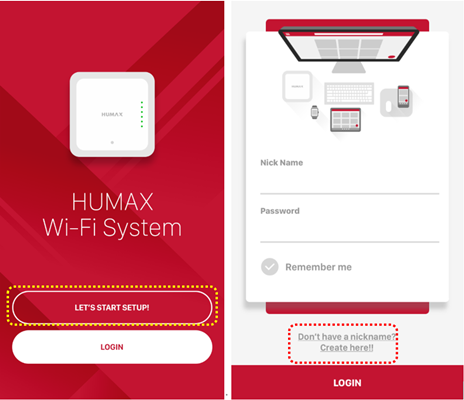 Launch the HUMAX Wi-Fi system app, and tap [Login] button. Enter your nickname and login password. Next, tap [Login] button at the bottom of the screen. Once you check an option titled ‘Save my information’ below the password field, you don’t have to enter your nickname and password whenever you run the app. Just tap [Login] button. 1. Please note that when you delete the mobile app, your nickname and password will be erased. 2. If you don’t have a nickname, please tap on a link titled “Do you have no nickname yet? You can create it here!” , so you can enter your nickname and password. You can turn off the LED using ‘LED Eco mode’ of the HUMAX Wi-Fi system. If you enable ‘LED Eco mode’, all LEDs except the Power LED will turn off. Log in to the mobile app. Tap the ‘system’ menu in the upper right corner of the homepage. Once you enable ‘LED Eco mode’, this mode will be immediately applied to both master and node(s). 4. What Are the Differences between Packages? - Consists of E3 + E3 + E3 (1 master, 2 nodes). 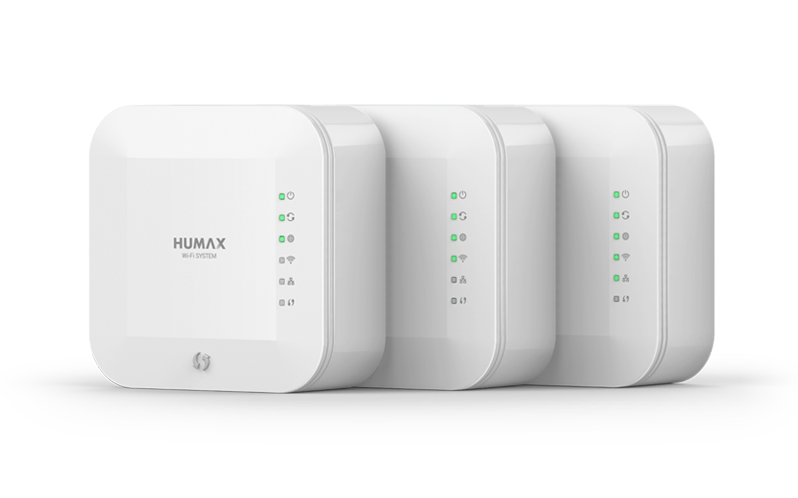 - Configures the HUMAX Wi-Fi system with three E3 units (which guarantees data rate up to 1,200Mbps) integrated in one package. - Ideal for home environment with large floor (of area ≥132m2) or complex structures. - Suitable for Wi-Fi shadow zone in spacious floor, and suitable for people who want to use wider Wi-Fi coverage on a single line as well. - Consists of E10 + E3 (1 master, 1 node). - E10 (data rate guaranteed up to 2,600Mbps) and E3 (data rate guaranteed up to 1,200Mbps) are configured in a single package. - This package is suitable for medium- and large-sized floors (with area of about 66 to 129m2). - Suitable for people who want to use strong Wi-Fi, high-definition (HD) video (through IPTV), NAS, or a variety of wired and wireless devices at the same time. - Consists of E3 + E2 (1 master, 1 node). - E3 (data rate guaranteed up to 1,200Mbps) and E2 (data rate guaranteed up to 750Mbps) are configured in a single package. - This package is suitable for small- and medium-sized floors (with area of about 33 to 96m2). - Suitable for people who do not have a good Wi-Fi connection via a single low-cost router, and those who want to benefit from the wider Wi-Fi coverage and higher speed guaranteed versus cost-effectiveness. 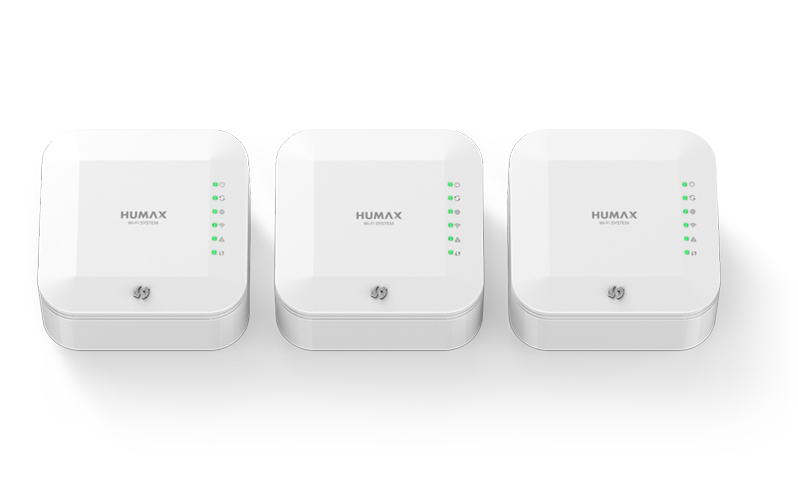 We are preparing the HUMAX Wi-Fi system fit for more diverse environments. - Consists of E10 + E10 (1 master, 1 node). 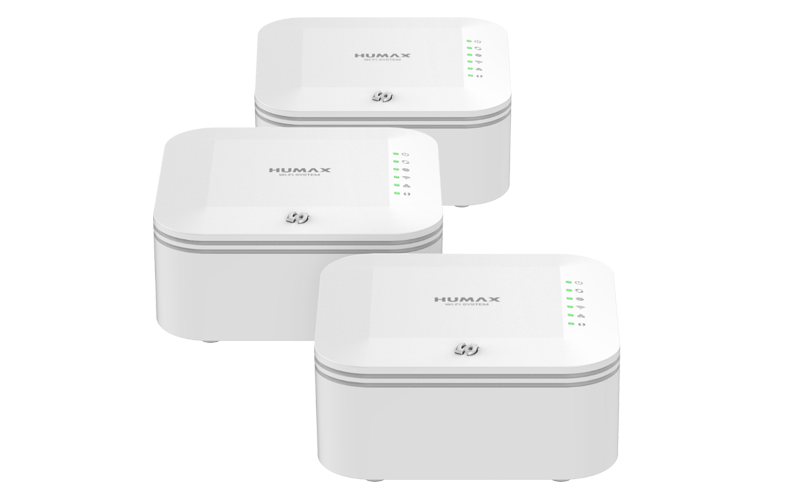 - Configures the HUMAX Wi-Fi system with two E10 units (which guarantees data rate up to 2,600Mbps) integrated in one package. - Consists of E3, E2 and E1 (Node 1) respectively. 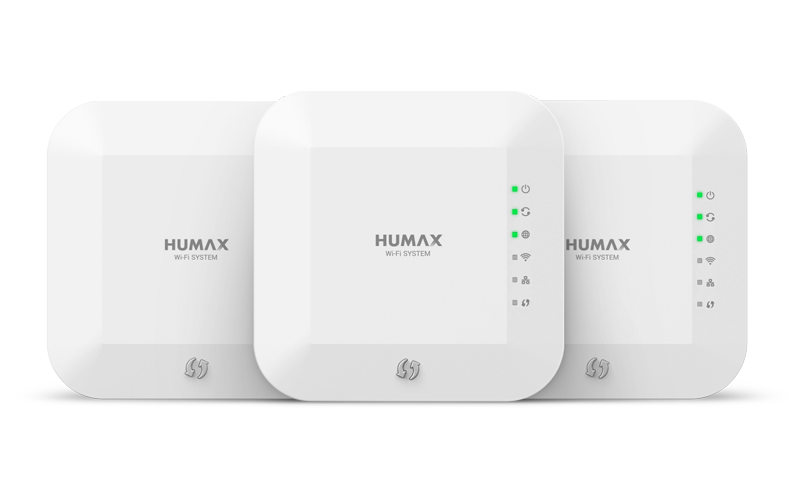 - Suitable for the case where you want to add a node to existing HUMAX Wi-Fi system. - Supports performance of E3 (AC1200), E2 (AC750) and E1 (N300). 1. Connect the Internet line to the Internet port of the master. 2. Connect the power of the master with the enclosed power adapter. 3. Wait until the power and Internet LEDs are turned on. 1. 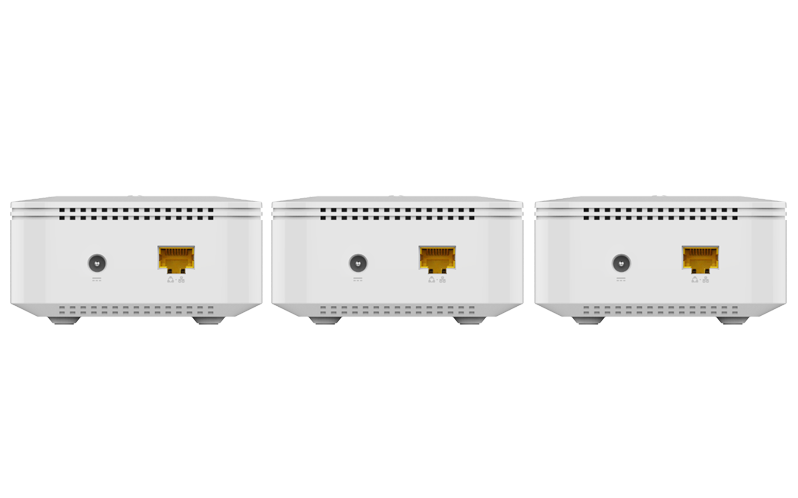 Place a node where you want to extend the Wi-Fi signal coverage, and connect the power of node with the power adapter enclosed. 2. While the power LED turns on and the pairing LED is blinking, the master connection is checked, so wait until the pairing LED stops blinking. Once the master-to-node pairing is completed, the pairing LED of node turns on in green. 1. 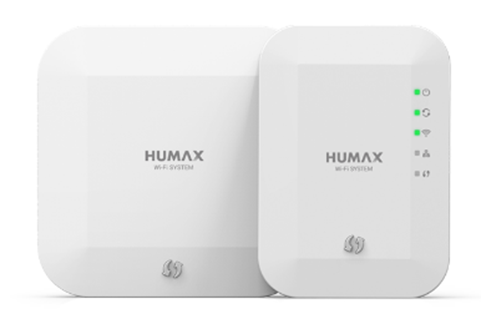 In HUMAX Wi-Fi system, its master and nodes are already paired with each other in the package. 2. If the pairing LED is constantly blinking, move the node into another position. The proper distance between master and node ranges from at least 1 meter to 15 meters depending on the surrounding environment. 3. If you have two nodes, you can install the subsequent node in the same procedure as described above. If you want to use a node in connection to the bottom of modem or router, please refer to the ‘Product Installation (for Using the Product with the Existing Router or Modem)’ in FAQs. 1. First, turn off the modem. 2. Connect the LAN port of modem to the Internet port of the master via the LAN cable enclosed. 3. Connect the Internet line to the Internet port of the master. 4. Connect the power of the master with the enclosed power adapter. 5. Turn on the modem. 6. Wait until the power and Internet LEDs are turned on. 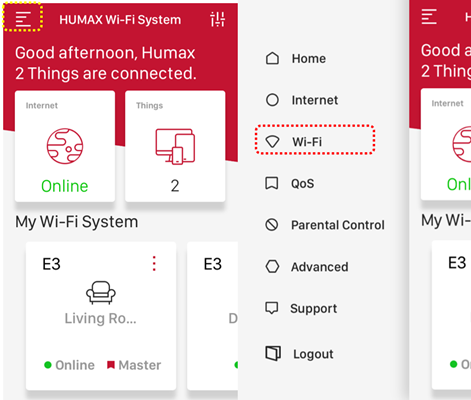 Once the master is completely installed, please download and install the mobile app for the HUMAX Wi-Fi system! You can check the installation status of master through the mobile app. 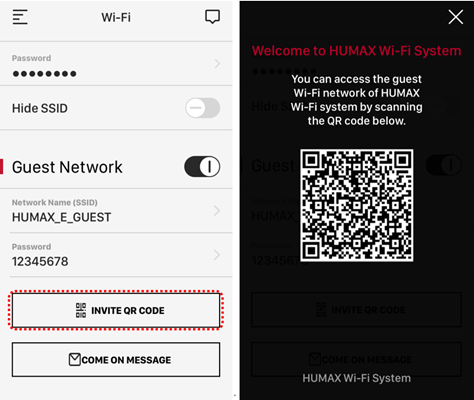 Search for the HUMAX Wi-Fi system in the App Store or Google Play, or scan the QR code for your product package. Then, you can move to an online app store where you can download the mobile app to your mobile device. 1. 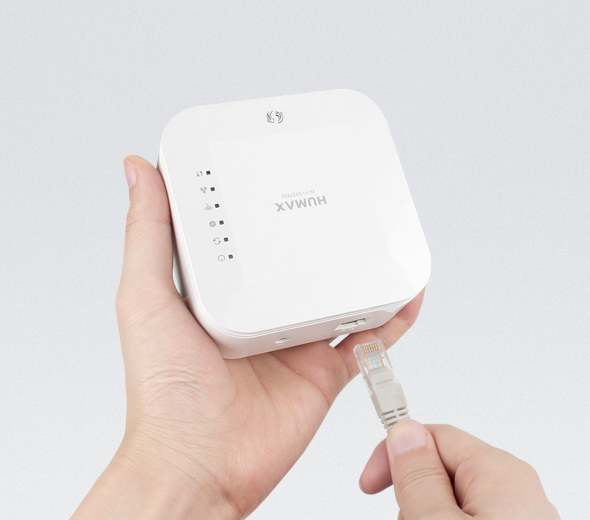 Place a node where you want to extend the Wi-Fi signal coverage and connect the power of node with the power adapter enclosed. If the pairing LED is constantly blinking, move the node into another position to re-install it. If you have two nodes, you can install the subsequent node in the same procedure as described above. E3 model has a total of six LEDs. You can check each LED for the current status of product. However, the LEDs operate in slightly different ways between master and node, so please be careful about such differences between them! Green: Power is turned on normally. Off: Power is not turned on. 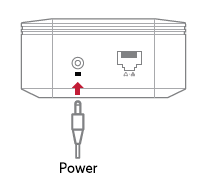 ※ Check if the enclosed power adapter is properly connected to the power source. Green: Pairing between master and node is normally connected. Turns ON when the master is paired with one or more nodes. Blinking in green: Indicates that the system attempts to pair the master with node(s), or such a pairing is in progress. Off: The master and the node are not paired. ※ Check the power status of the node or place the node closer to the master. Green: Normally connected to the Internet. Green flicker: Indicates that the upgrade of firmware is in progress. Off: Not connected normally to the Internet. ※ Check whether the Internet line is connected to the LAN port. Wireless Green: The Wi-Fi is operating normally. Green: Indicates that a LAN cable is connected to the LAN port. Off: Indicates that a LAN cable is not connected to the LAN port. 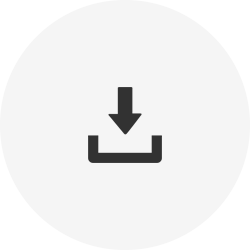 Green: Tap [WPS] button to attempt pairing. If the pairing is normally done, LED turns on for 3 minutes. Green flicker: Tap [WPS] button to attempt pairing. LED blinks for 2 minutes when the pairing attempt is in progress. Off: The WPS connection is completed, or the WPS is not operating. Green: Pairing between master and node is normally connected. Green flicker: Indicates that the system attempts to pair the master with node(s), or such a pairing is in progress. Green flicker: Firmware upgrade is in progress. ※ Check the pairing status between master and node. Green: Indicates that a client device is connected via LAN cable to the LAN port. 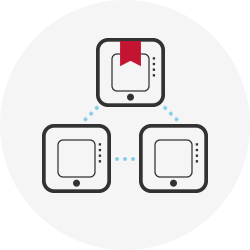 Off: Indicates that no client device is connected via LAN cable to the LAN port. 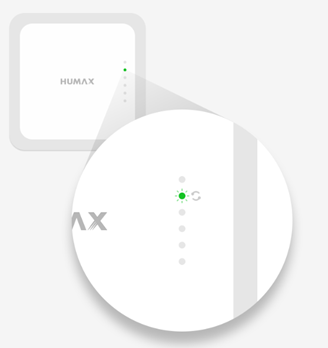 You can connect wirelessly to HUMAX products from various operating systems. Click the Wi-Fi mark on the bottom right side. Click the Wi-Fi icon on the top side, and click the SSID you want to connect to. Next, click [Connect] button. Enter your Wi-Fi password. Then, the connection to Wi-Fi is completed. Click the Wi-Fi icon on the top side, and click the SSID you want to connect to. Once the connection is completed, the Wi-Fi icon will appear on the top side as shown below. In Wi-Fi settings, enable Wi-Fi and click the SSID you want to connect to. Enable Wi-Fi and click the SSID you want to connect to. 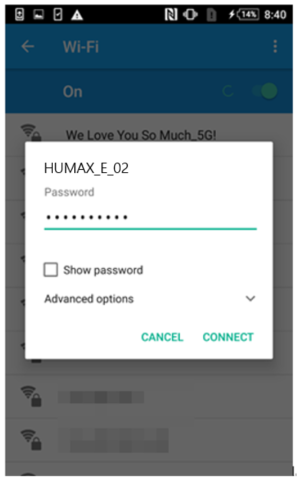 If the wireless connection to HUMAX router is not successful or your wireless password is changed, delete your existing profile for wireless connection to make the wireless connection. Click the Wi-Fi mark on the bottom right side in Windows. Click on Network & Internet Settings. Click the Wi-Fi icon and then click on Manage Known Networks. Click on the profile of saved wireless SSID to delete it. Click the Wi-Fi icon on the top side and click on the Network Settings. Click the padlock icon on the left side of menu to unlock it and click the Advanced icon. Click on the profile of saved wireless SSID, and then click [–] icon to delete the profile. In the W-Fi settings, click the exclamation mark (!) icon next to the SSID you want to delete, and then click on ‘Delete this network’ to delete your wireless profile. In the W-Fi settings, click and hold the SSID you want to delete, and then click on ‘Delete this network’ to delete your wireless profile. Follow the steps described below, so you can find out your Wi-Fi password. 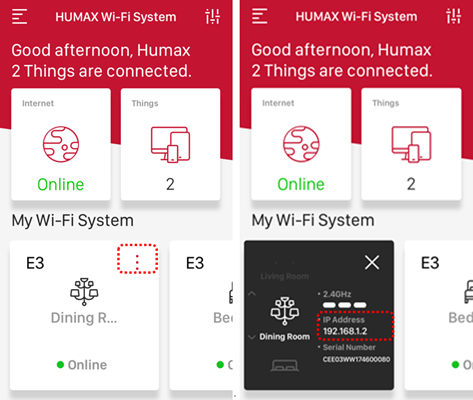 You can run HUMAX Wi-Fi app anywhere, regardless of wireless environment. 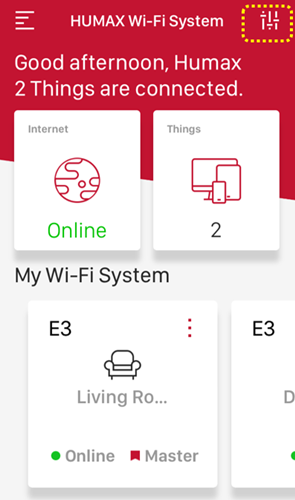 Select Home > Menu (button on the top left) > Wi-Fi respectively. Tap your password on the Wi-Fi screen. 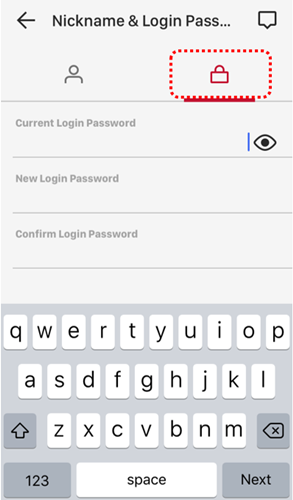 Tap the eye-shaped icon next to the password and check the currently set password. Search for the HUMAX Wi-Fi system in the App Store or Google Play, or Scan the QR code as shown below. 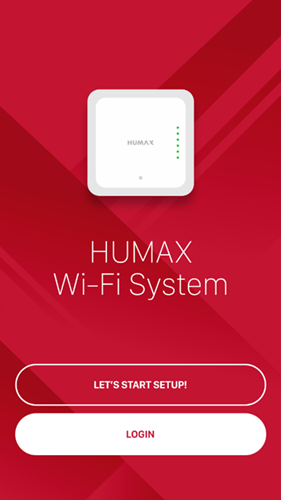 Then you can move to an online app store where you can download the HUMAX Wi-Fi system app. Scan the QR code, so you can move to an online app store where you can down and install the app. 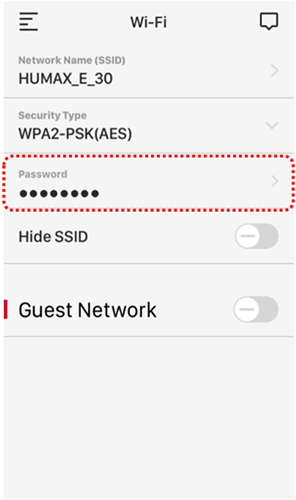 In Wi-Fi settings, enable Wi-Fi and click the network name (SSID) you want to connect to. You can find the default network name (SSID) and password on the rear label of the product. Enable Wi-Fi and click the network name (SSID) you want to connect to. 1. 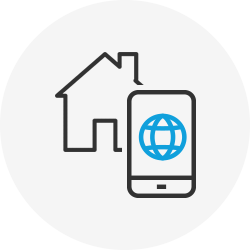 The mobile app must be installed on your device. 2. 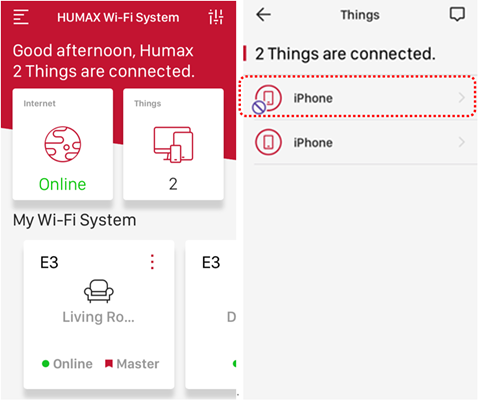 Your mobile device must be connected to the HUMAX Wi-Fi system. For further information, please refer to ‘Install the Wi-Fi System Mobile App and Connect to Wi-Fi’ in FAQs. 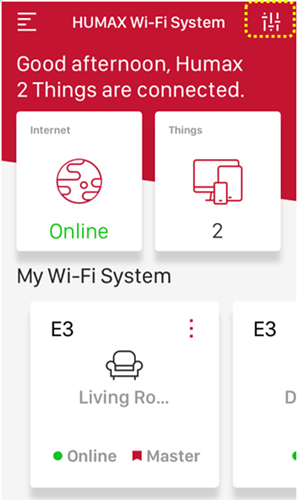 Run the mobile app for HUMAX Wi-Fi system. When the initial launch screen of mobile app comes up, tap [Create Account] button. Please create a nickname you want to use in the mobile app. 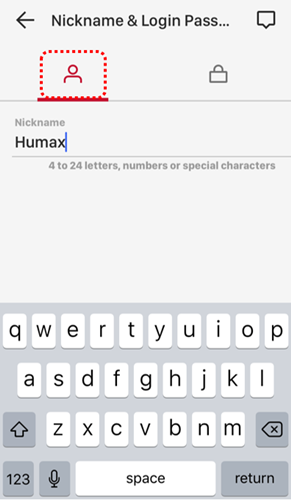 Use simple unforgettable characters to fill out the field of nickname that you want to use when logging in the system, and then tap [Next] button. Please enter your login password to authenticate with your mobile app and router. 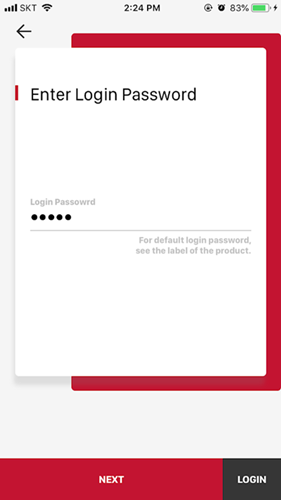 The initial login password is a ‘mobile app password’ marked on the label at the bottom of product package. However, please log in to the app once again for security! 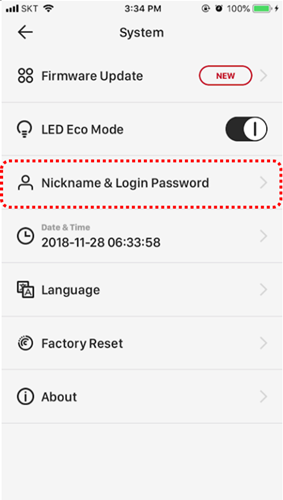 Once you check an option titled ‘Save my information’ below the password field, your login information will be saved on your device, so you can log in to the app more conveniently next time. However, your mobile device may be vulnerable in security. Once login is successful, you can go to the home screen. 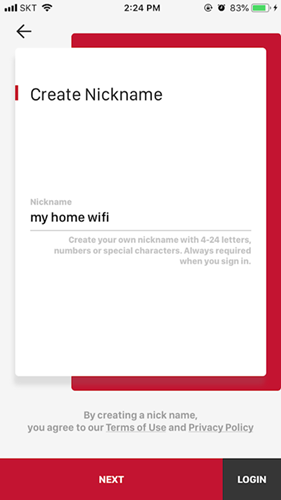 a password required for you to log in to the Wi-Fi system app. If you use a modified login password, you need to reset the product. Tap and hold [WPS] button on top of the master for 10 seconds or longer. All settings including the login password are initialized after rebooting the master. If you keep using the initial login password without changing your login password, you can check the initial login PW on the product label. 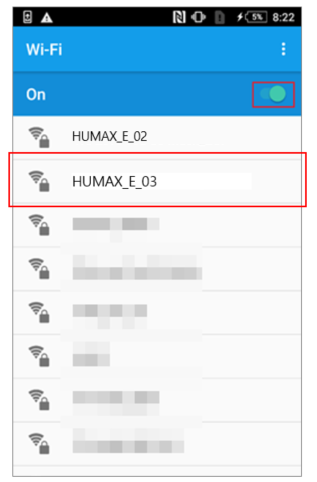 You can check the current IP address of master/node in the HUMAX Wi-Fi system. 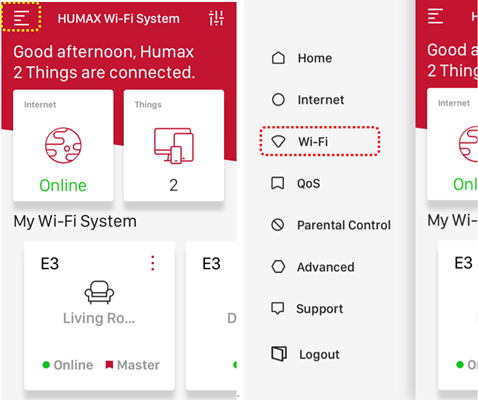 On the home screen, ‘My Wi-Fi system’ indicates a list of masters/nodes paired to the HUMAX Wi-Fi system. By swiping on the screen from side to side, you can check information on all the masters and nodes. 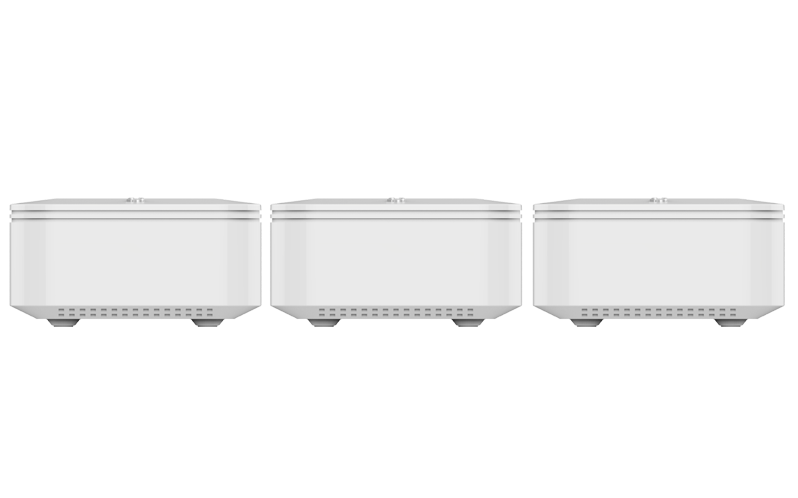 The device listed on the leftmost is the master, and the paired nodes are listed to the right side of the master. 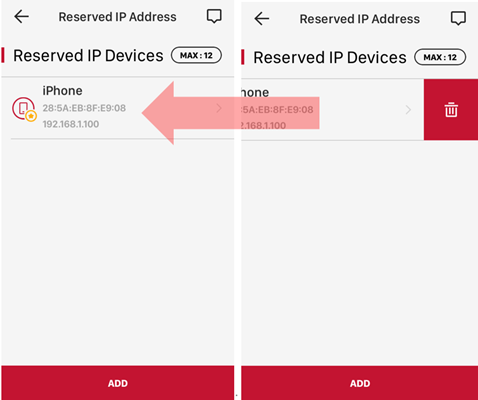 Tap the menu on the right side of the master or nodes you want to check, so you can check the IP address assigned to them. and the IP address of the node means the LAN IP address assigned to the internal network. 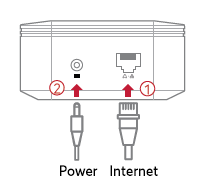 1) If the Internet connection is ‘offline’, it means that the Internet is not connected normally, so please check the Internet cable for proper connection at first. If the Internet is normally connected but it still appears ‘offline’ on screen 2) If the IP address of master is displayed as ‘–’, it means that the IP address has not been received normally from the Internet. 3) If the IP address of node is displayed as ‘–’, it means that the IP address has not been received normally from the master. Check the node(s) for proper pairing status. You can check the IP address of the wired / wireless devices (PC, smart phone, etc.) connected in HUMAX Wi-Fi System. 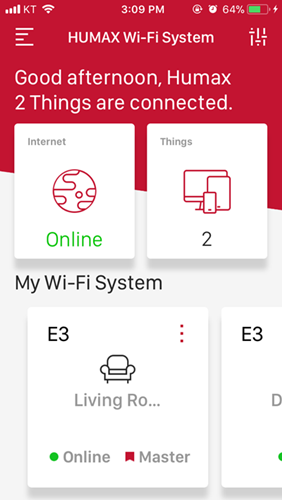 Tap the ‘Connected Devices’ on the home screen. 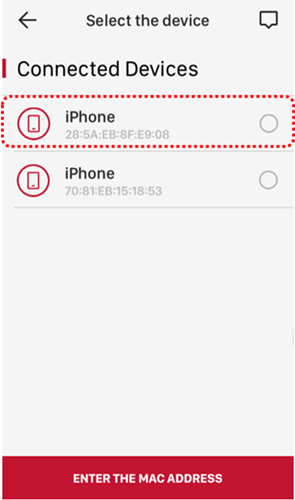 Tap a device you want to check, so you can check the IP address assigned to that. 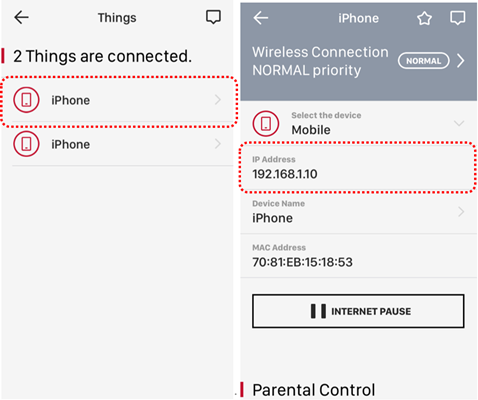 If a device you want to check is not available in the connected devices, it means that the device is not connected to the network. 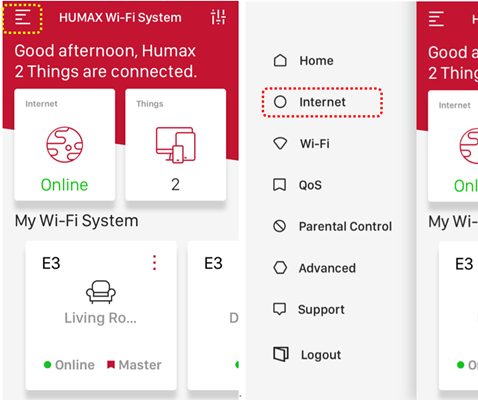 The HUMAX Wi-Fi system provides an automatic Internet setting, and you can set the LAN IP addresses of the connected devices. Change the LAN IP address of the master. When you change the LAN IP address, it automatically sets the range of DHCP address according to the changed IP band. 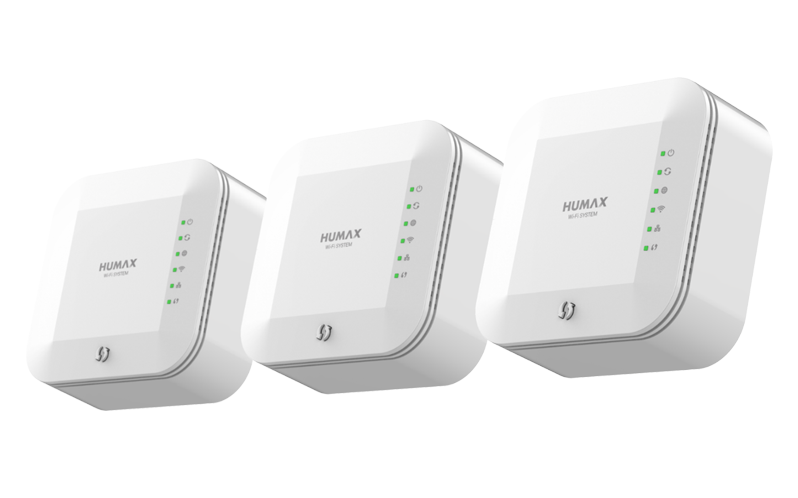 Specify the DHCP address range to be assigned to the devices connected to the HUMAX Wi-Fi system. 1. 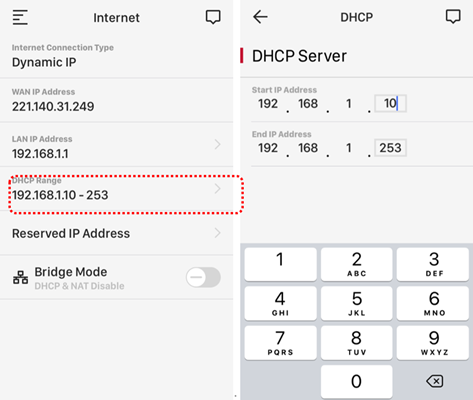 If you set the range of DHCP address too small, the connection to a desired device may be restricted, so it is recommended to maximize the range of DHCP address. 2. Setting the range of DHCP address is not supported in Bridge mode. 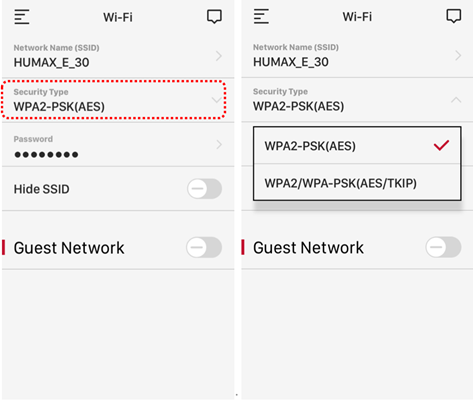 You can assign specific IP addresses to the devices connected to the HUMAX Wi-Fi system. When a specified device is connected to local network, it receives IP address assigned from the DHCP server. Here, the device may receive the IP address you assigned. As a method identical to the fixed IP, this may be required for connecting to a server where the IP address does not dynamically change or for external connection. 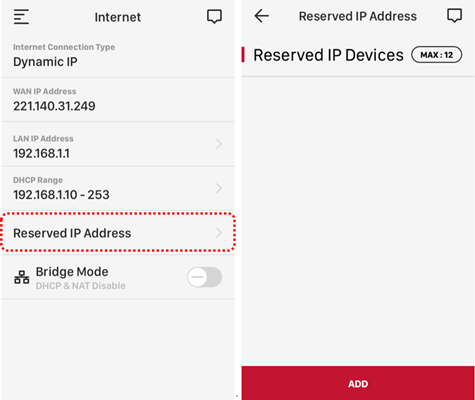 Select ‘Reserved IP address’ and tap [Add] button. Select a device for which you want to use a fixed IP address, and specify the IP address for the device. 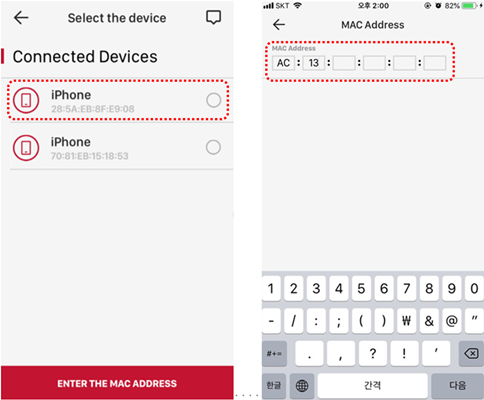 If there are no desired devices in Connected Devices and Devices Not Connected, tap [Enter MAC Address] to add a device directly. Complete all the settings, and tap [Save] button to finish. 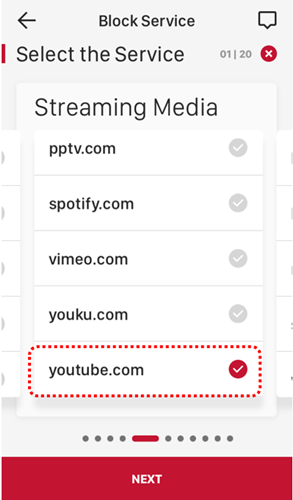 You can delete a list of reserved IP addresses by swiping on the applicable list to the left. You can configure the Wi-Fi settings of the HUMAX Wi-Fi system. HUMAX Wi-Fi System is available with a single network name (SSID) and password, regardless of the 2.4GHz or 5GHz processor, so you can use the powerful Wi-Fi whenever and wherever you want just with a single entry of your password. Actually, the HUMAX Wi-Fi system is automatically set to the optimal Wi-Fi channel. 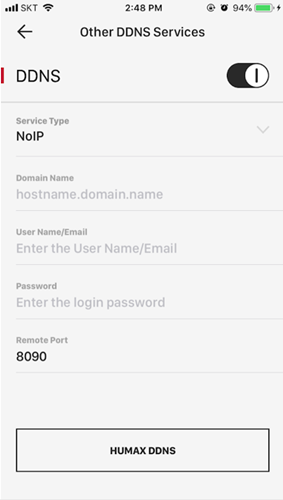 Tap the ‘Network Name (SSID)’ and modify it to another network name (SSID) you want to use. Modify the SSID and tap [Save] button to immediately apply it. Network name (SSID) is changed, so your device needs to be connected to Wi-Fi again. Once your device is reconnected to Wi-Fi, please log in to the mobile app. 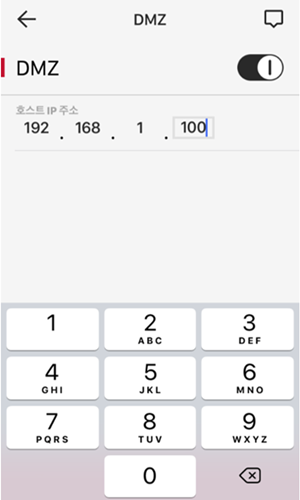 Tap ‘Security Type’ and select the security type to use. Tap ‘Password’ and enter the password to use. In order to change your password, you must enter the same password once again for security. Enter your password and tap [Save] button to immediately apply it. Your password is changed, so your device needs to be connected to Wi-Fi again. 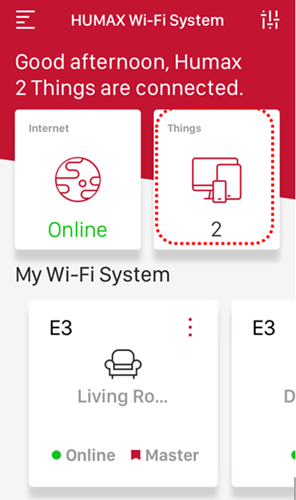 Once your device is reconnected to Wi-Fi, please log in to the mobile app. 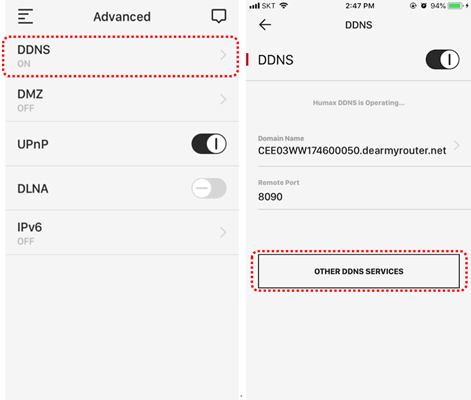 If you select the ‘Hide the Network Name (SSID)’ option, the network name (SSID) is not shown on screen when scanning and displaying a list of APs with your mobile device. You can connect to a network only by manually entering its network name (SSID) and attempting to connect to the network. Tap the ‘Hide SSID’ option to enable it. When a popup message comes up for confirming your selection, tap [OK] button to apply this option immediately. Tap [Cancel] button to cancel the operation. 1. 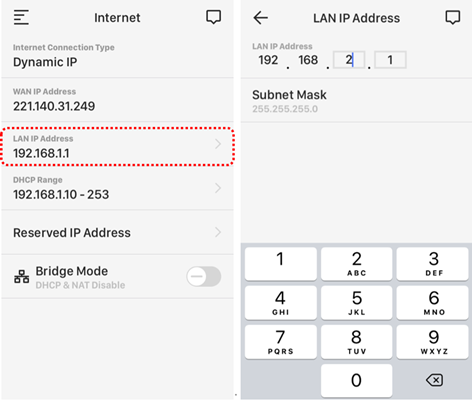 Network name (SSID) is changed into the hidden status, so your device needs to be connected to Wi-Fi again. 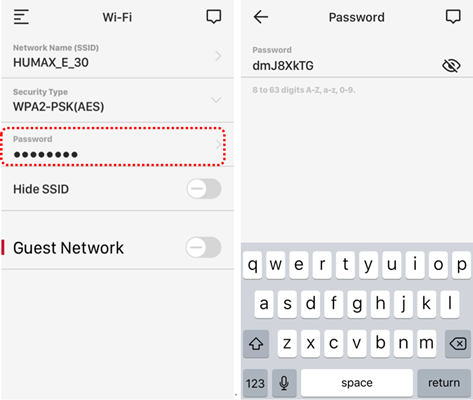 If you want to connect your device to Wi-Fi, you must manually enter the network name (SSID) you remember, and then try to connect to Wi-Fi. Please remember your security type and password as well, because you need to enter them together. 2. 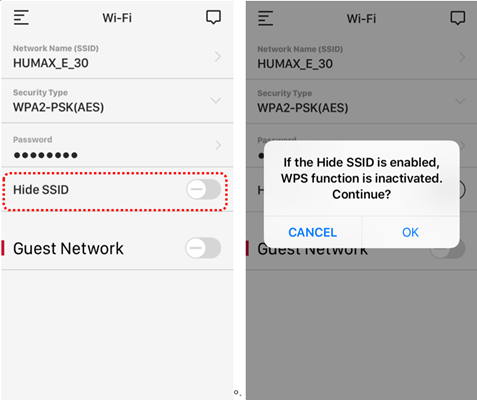 You cannot use the WPS if the Hide SSID function is enabled. 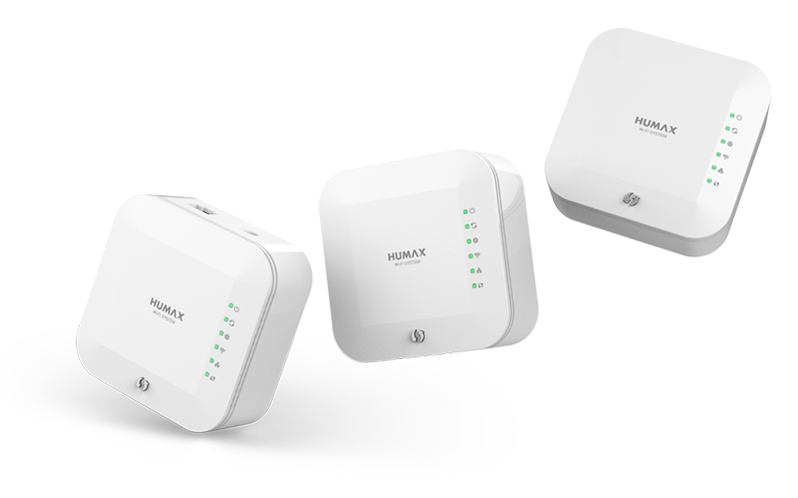 The HUMAX Wi-Fi system provides the guest network function to allow using multiple wireless SSIDs. You can protect the internal network of the main Wi-Fi by separating from the mainly used Wi-Fi. Configure the guest network as described below. Enable the guest network and set the network name (SSID) and password. 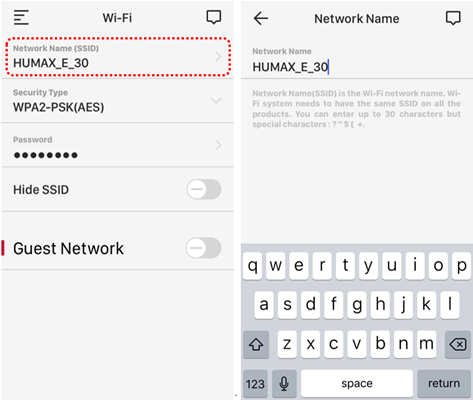 The network name (SSID) is set to “HUMAX_E_GUEST” by default, and the password is set to “12345678” by default, but both SSID and password can be modified. The security type of password is set the same as that of default Wi-Fi system. 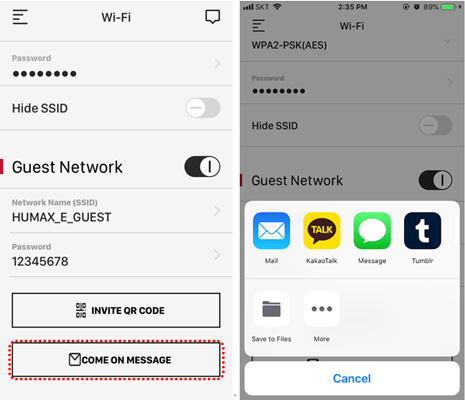 Tap on ‘Invite with QR Code’ and ‘Send Invitation Message’ options, so you can share the network name (SSID) and password of guest network with other users. If you tap ‘Invite with QR Code,‘ a QR code that can be scanned is provided. The sharing users can easily connect to the guest network by scanning the QR code. 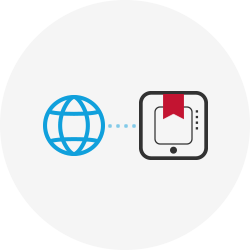 Depending on the type, OS and version of mobile device that scan the QR code, there may be slightly different paths for connection to Wi-Fi system. 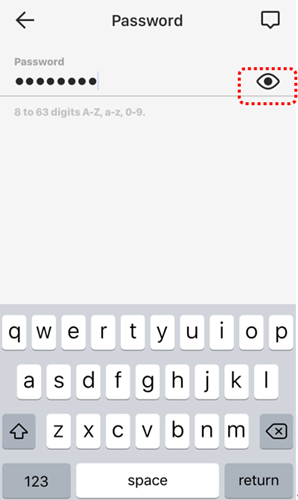 If you tap ‘Send Invitation message,’ the list of apps to send the message is displayed. Select the app to share. SMS, e-mail, Kakao Talk, LINE, Facebook Messenger, and Skype can be supported for this invitation. However, a list of apps shows up on screen only if they are already installed in your mobile device. You can edit the details of the invitation message. The default information is network name (SSID) and password. 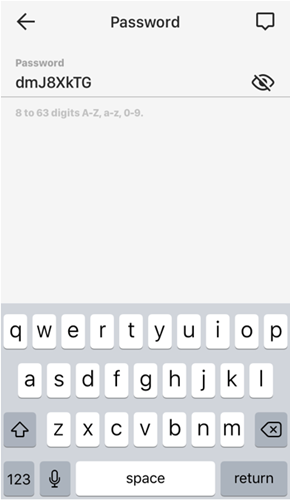 The shared user can connect to the guest network more easily by searching with the network name (SSID) and copying the password. The HUMAX Wi-Fi system provides a function of restricting and managing the Internet access period and some services such as games, YouTube, and SNS to help parents ensure that their children are using the Internet safely. 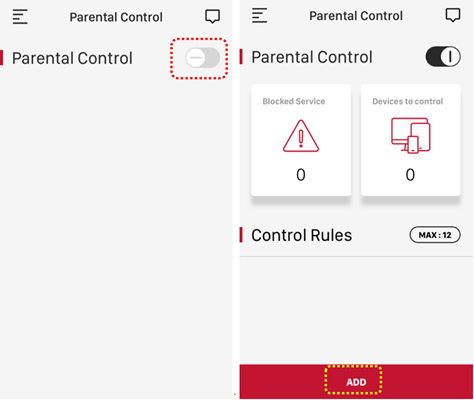 Enable the Parental Control function and tap the ‘Add’ button to add the control rule. Please select any device that you want to restrict. 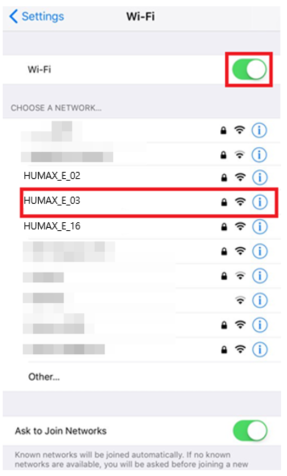 If the device you want to restrict is not connected to the HUMAX Wi-Fi system, you can tap [Enter MAC Address] button to directly enter the MAC address. Please select any service that you want to restrict. You can select up to 20 services to restrict. Once you select the service you want to restrict, tap [Next] button. 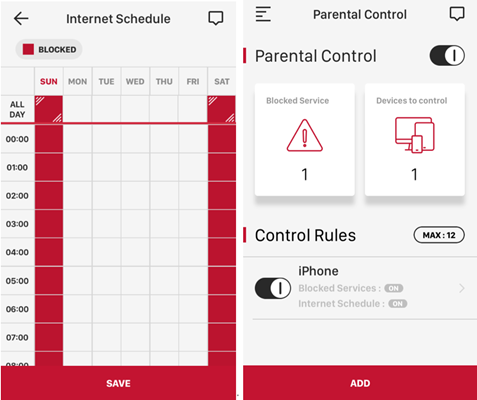 You can set the Internet block schedule by weekday or time. You can check the settings in “Things” on the homepage. 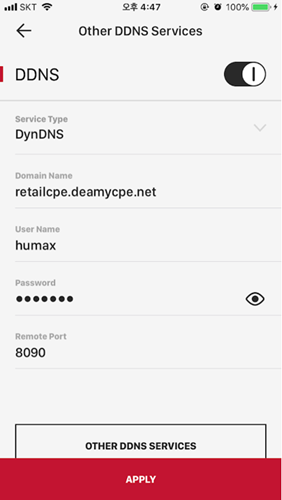 HUMAX Wi-Fi system supports free services like HUMAX DDNS as well as other services such as DynDNS, NoIP, and DuckDNS DDNS. You can use it with HUMAX DDNS simultaneously. Select ‘DDNS’ in Advanced Functions menu. HUMAX DDNS is operated by default. 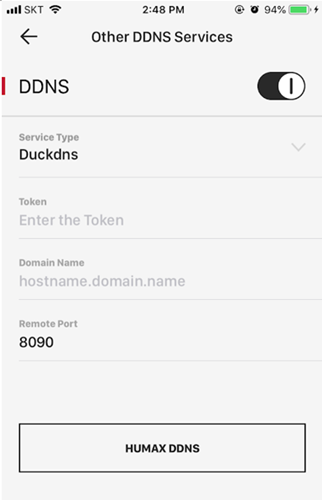 In addition, if you want to use other DDNS services, tap [Other DDNS Services] button. 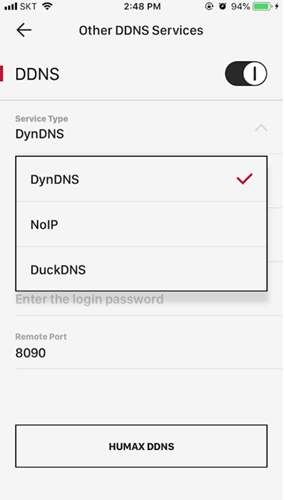 Select the type of DDNS service. In order to use a service, you have to join the membership in the website of each service, and subscribe to the service. The information you need to use DDNS service varies depending on service providers. 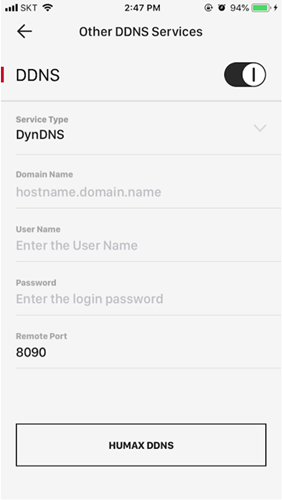 You have to configure DDNS settings on their website before you can use their DDNS services through this router. Enter the items that match the selected service type. Each entry should be filled in with information received from the service provider you select. Fill out all entries and then tap [Apply] button. 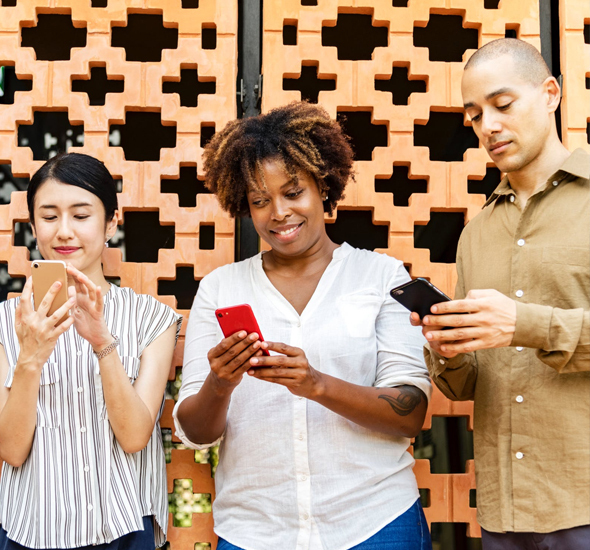 If the entries you filled out do not match the values you set on each service provider’s website, the mobile app may not work in practice, so please be sure to enter the correct information. Now you can use a variety of services with the domain address that is completely set up. 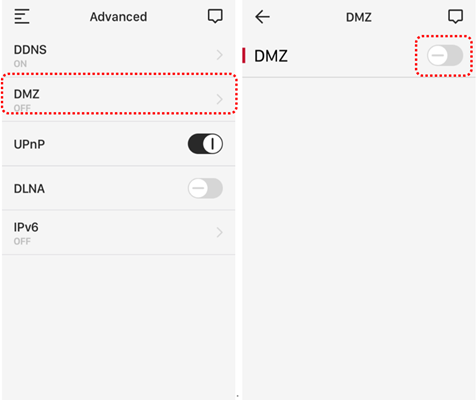 DMZ is a subnet that allows you to send all network data to the connected specific devices, so you can use special features such as games, video conferencing and server operation smoothly with devices inside the router. Select ‘DMZ’ in Advanced Functions menu and enable it. Set the LAN IP of the device selected for the DMZ. The IP address of DMZ host may be changed by the DHCP server of router. Thus, you should use it as a static IP address so that it cannot be changed. For more information on how to assign a static IP address, please refer to ‘How to Set Static IP’ in FAQs. The HUMAX Wi-Fi system supports IPv6 (Internet Version 6). 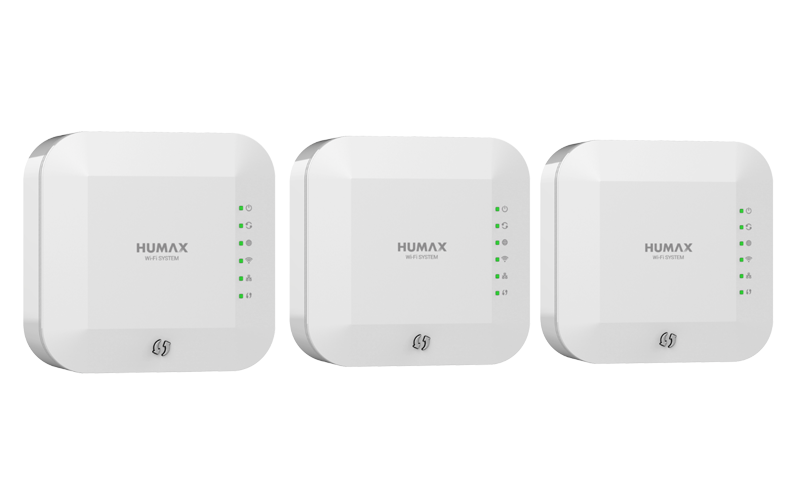 If there is an IPv6 server in the higher-level network than the HUMAX Wi-Fi, the HUMAX Wi-Fi system automatically assigns the IPv6 addresses to the devices connected to the internal network so that they can connect to the Internet using IPv6. 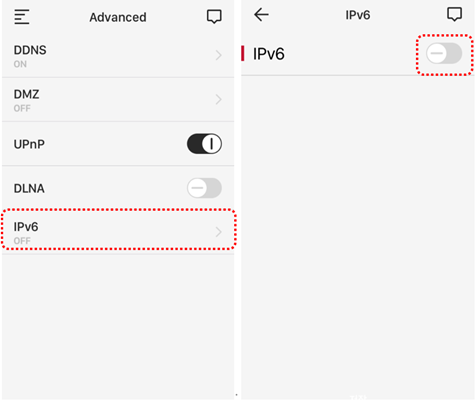 Note: An internal network device can connect to the Internet using IPv6 only if it supports IPv6 and there is an IPv6 server in the higher-level network. 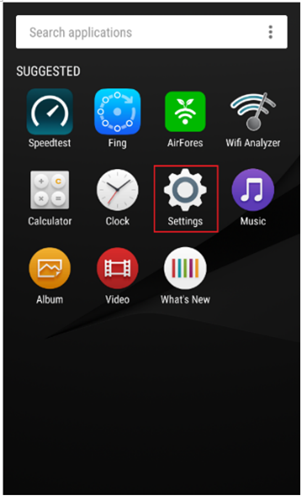 Tap on the ‘Menu’ in the top left side of the home screen and select ‘Advanced Functions’ menu. 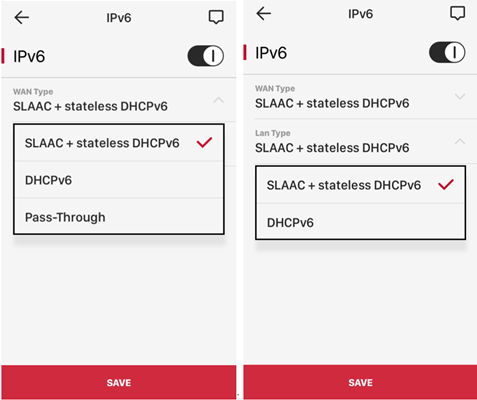 Select “IPv6” and enable it in the Advanced function. You can check if new firmware of the HUMAX Wi-Fi system is available and upgrade through the server. 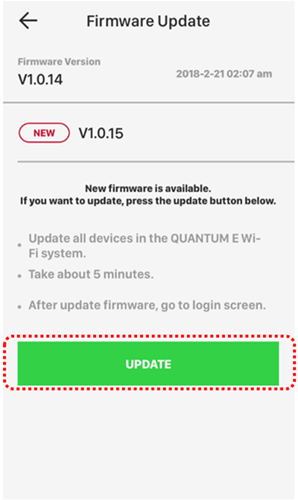 NEW is marked next to the ‘Firmware Update’ menu if there is a new firmware release. If the currently installed version is up-to-date, there is no mark coming up. 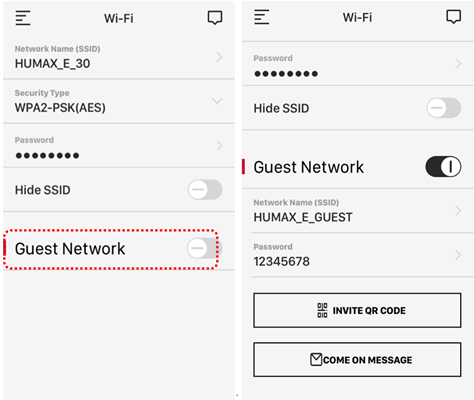 Please update the firmware of mobile app when the master and all nodes connected to HUMAX Wi-Fi system are online! If the master or nodes are offline, the firmware may not be updated normally. 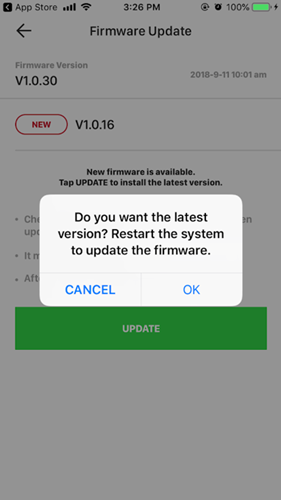 When a message ‘System Restarts’ comes up on screen after updating the firmware to its latest version, please tap [OK] button. Once the firmware upgrade is completed, the system restarts automatically, which takes about 5 minutes in total. You can turn off the LED using ‘LED Eco mode’ of the HUMAX Wi-Fi system. If you enable ‘LED Eco mode’, all LEDs except the Power LED will turn off. 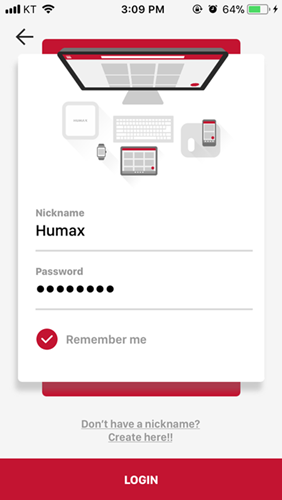 Both login nickname and password are account information required for you to log in to the HUMAX Wi-Fi system mobile app. The initial login password is marked on the product label but it may be vulnerable in security, so it is recommended to change your password after the initial login. Tap the icon of system ‘menu’ on the top right corner of home screen. Tap the man-shaped icon of nickname and change your nickname. Your existing nickname is already entered, so please delete it and enter a new nickname. Enter your new nickname and tap [Save] button. Then the new nickname will be applied to the system immediately. 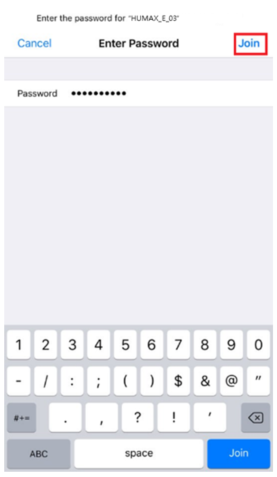 Tap the lock-shaped icon of password setting to change your password. If you enter the current login password wrong, you cannot change it to new one. If you don’t remember your current login password, please refer to the ‘When You Forgot Your Mobile App Login Password’ in FAQs. It is recommended that you set your login password which consists of 4 to 12 letters and numbers as well as one or more special characters. When entering a new login password, please refer to a popup guide available for password security. Complete all the settings and tap [Save] button. Then, the new password you entered will be applied to the system immediately. You can set both time and time zone of the HUMAX Wi-Fi system. 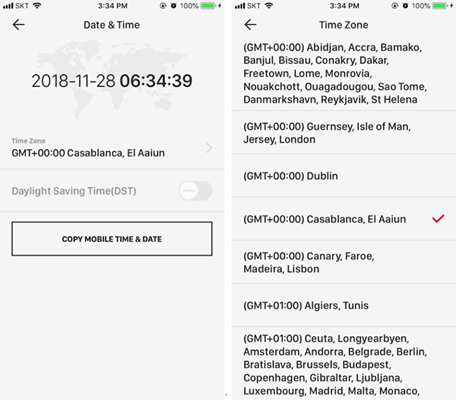 If the time zone is set incorrectly, you can also change the time zone by selecting another one listed in the ‘Time Zone’ submenu. Change the time zone and tap [Save] button to immediately apply it. 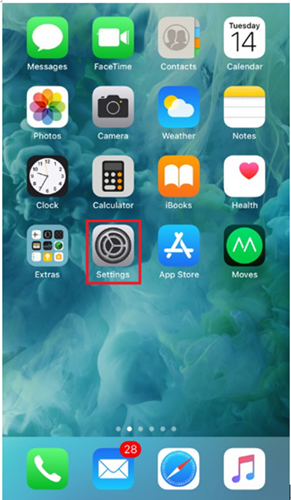 Tap the icon of system ’Setting’ menu on the top right corner of home screen. Tap ‘Factory Reset’ menu and proceed. Tap [Factory Reset] button and a pop-up message is displayed. Then tap [OK] button to start the factory reset. If you don’t want to reset the product, tap [Cancel] button. 1. Both master and nodes must be online to reset the entire Wi-Fi system. Make sure that they are online. 2. The product will be reset, and all the data you set before will be deleted. However, the firmware will be kept updated as its latest version. 3. If you add a single package apart from the basic Wi-Fi system package, you must ‘add nodes’ manually for the single package after the factory reset. For details, please refer to ‘Add Nodes’ in FAQs. 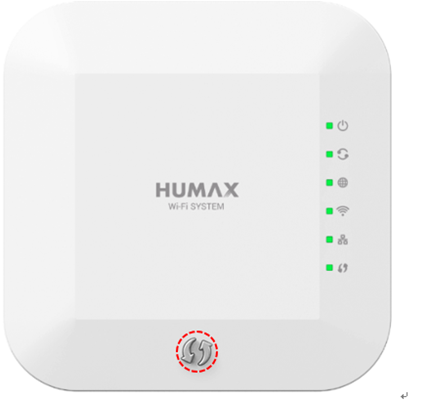 Humax Wi-Fi system is basically available as a package of its components (i.e. products) paired with each other, so no pairing procedure is required any more. 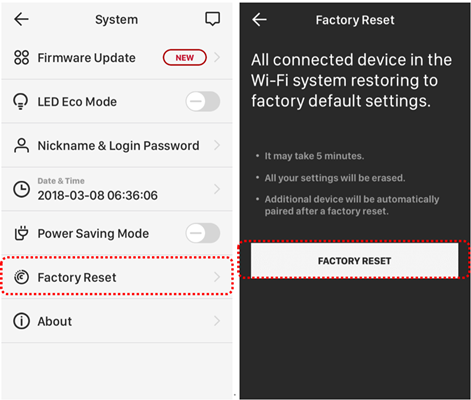 Factory reset takes about 5 minutes; master and node are automatically paired when factory reset is completed. 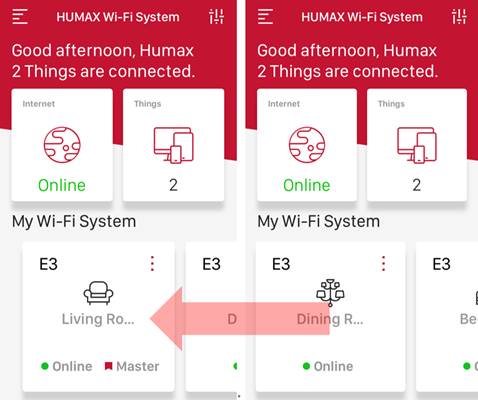 Prioritizing the devices connected to the HUMAX Wi-Fi system can enhance data processing. 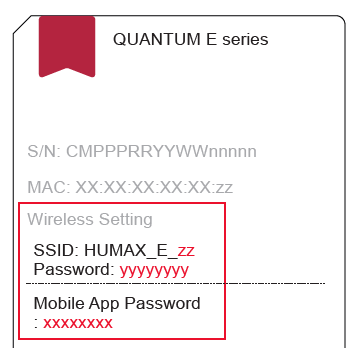 Set up the QoS for any device whose data rate you want to increase and enjoy using the HUMAX Wi-Fi system more comfortably. Toggle the QoS button to enable the QoS, and tap [Add] button below to add any desired item. Please select any device that you want to prioritize. 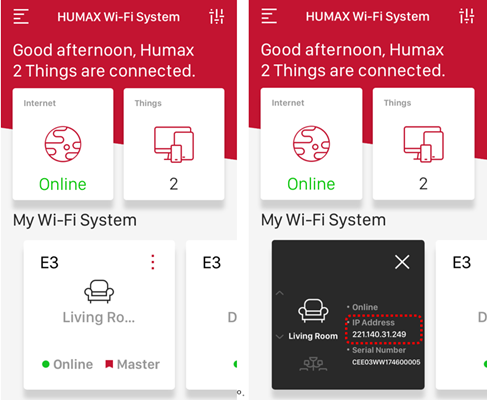 Devices connected to the HUMAX Wi-Fi system show up on screen automatically. 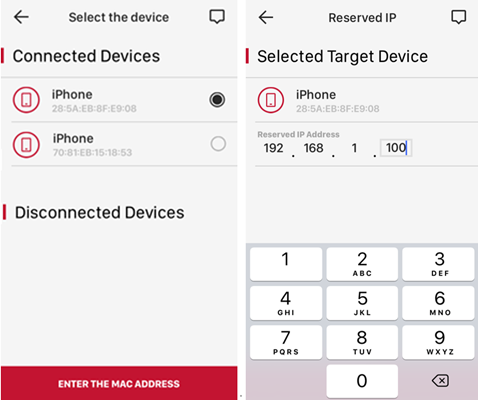 If there is any unknown device, you can tap the [Enter MAC Address] button to enter the device manually. 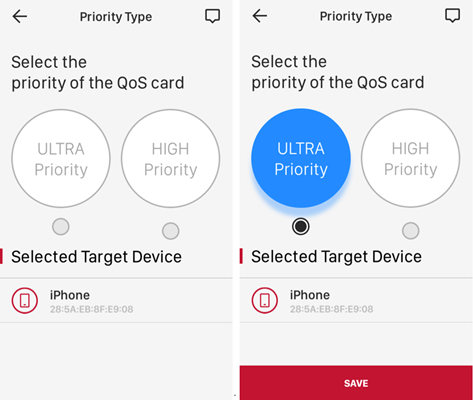 Select the priority level of your selected device and tap [Save] button. The ‘ULTRA’ priority is set higher than the ‘HIGH’ priority. 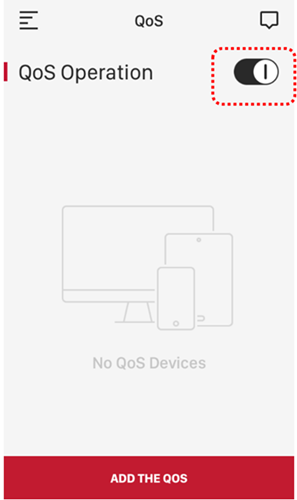 You can check the devices on the ‘QoS’ screen or the ‘Home > Connected Devices’ screen. 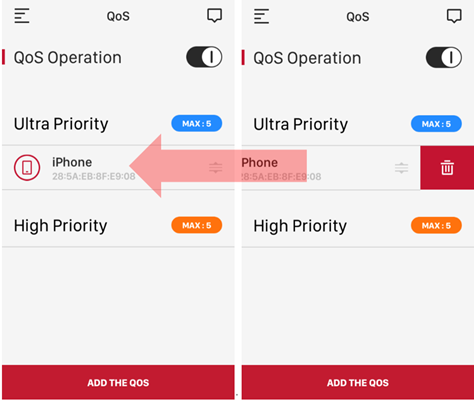 In order to delete a QoS item, select a QoS item you want to delete in the QoS screen and swipe on the item from right to left. Then [Delete] button comes up. You can use HUMAX DDNS services available free of charge through the HUMAX Wi-Fi system. 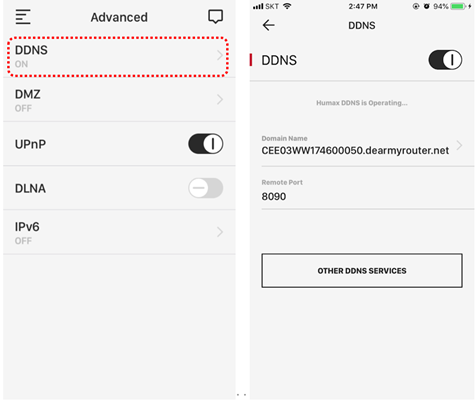 You can use DDNS services easily with simple settings. 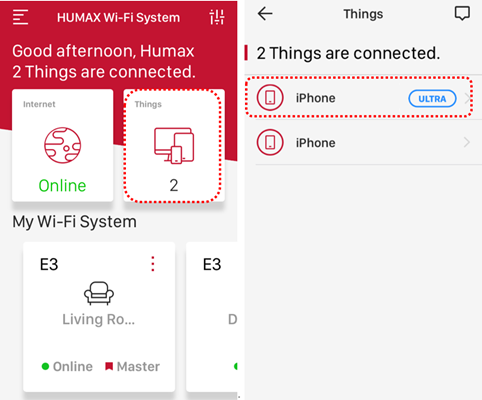 DDNS settings make it easy for you to access the HUMAX Wi-Fi system and find out your devices connected to the system in company and public areas. Select ‘DDNS’ in ‘Advanced Functions’ menu. HUMAX DDNS is enabled by default. Tap on ‘Domain Name’ to edit your domain name with words that can be easily remembered.